This summer we’ve seen some very impressive devices from the top phone manufacturers. In this article we’ll take a look at what we think are the best smartphones of 2012. This smartphone is at the top, or near the top, of everyone’s smartphone rankings, and with good reason. You can find it on virtually every major carrier in the United States. Even the folks at Apple, known for this, have not been able to achieve this level of carrier adoption. The hardware is great, although perhaps not innovative enough. Some great software features include Smart Stay, Direct Call, Smart Alert, and the S Voice system for voice commands. With a competitive price and plenty of power under the hood, the Samsung Galaxy S III is definitely one of the best, if not the best, smartphone of 2012. People who use this phone swear by it and, you will have a hard time finding a better priced phone. It is attractive to use, looks sleek and beautiful, and has great hardware. Lovers of Windows Phone will find that this is one of the best possible implementations of this platform. Of course, the Nokia Lumia 900 is way behind the other best phones in regards to adoption and market share. Users will fall in love with its great display and the eight megapixel camera. Perhaps the only problem with the HTC One series is that they didn’t have the foresight that Samsung had by achieving broad carrier adoption at all costs. In this series, the HTC One X is probably the stand out among the best smartphones of 2012. Each carrier has a few tweaks to these smartphones with some standouts being the convenience of the HTC One S’ small size and the added features of the EVO 4G LTE. Of course, no list of the best smartphone of 2012 (or any recent year) would be complete without the latest iPhone. These phones inspire an almost religious following due to their unique design and flow philosophy. Although gadget power users and tinkerers may get bored with the lack of customization, compared with other Android phones, the iPhone 4S is amazing. Siri is great, the applications are very good, the iPhone 4S camera is one of the best on the market, and its battery life and display are all top notch. This guest post was brought to you by George. 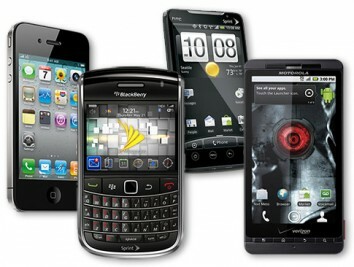 George has been reviewing mobile phones for many years and is a content writer for mobiles.com.au.